Hi everyone! I'm James. 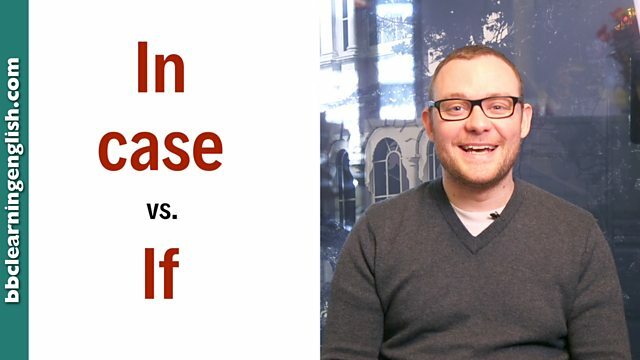 We're going to look at the difference between in case and if in today's English In A Minute. In the example with if, it means that I might call you in the future, but it depends if I need help or not. The second sentence with in case means I'm going to call you before I do my homework to prevent any problems. Just like in our first example, in case means I am going to take my umbrella anyway to prevent any problems. But in the example with if, this means that you only take an umbrella because it is raining when you leave. So if you want to learn more English, join us on social media or on our website. In case you can't remember the link, here it is. What do we need to remember when we switch the clauses? We use 'in case' as a precaution against something. Remember, 'in case' is a precaution taken whether we know something will happen or not.